So I started doing research. 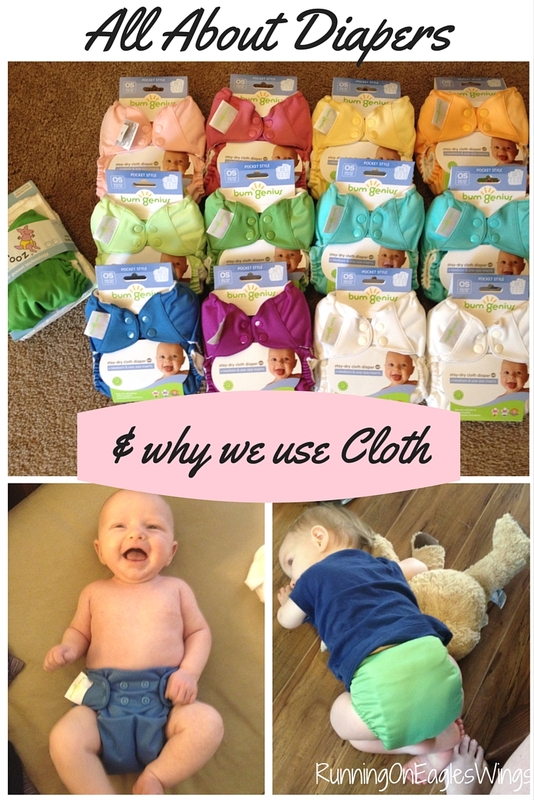 I had read a post by Emily at Daily Garnish on her cloth diapering experience. From there I read posts by Young House Love and a few others. I also talked to a few friends and gathered lots of research. I did my research on all the different brands of diapers. I watched YouTube videos. (That was new for me as I was not keen on watching videos.) I researched places to buy diapers and all the costs and accessories. I read all about washing them and the details. The next step was convincing the husband. I gathered my research and costs and everything all organized to present it to him. It took me weeks to gain the courage to bring it up! When I finally did I barely had 10 words out of my mouth before he was turning me down. I argued for him to hear me out. He did. In the end, I won because he doesn’t really have much interest in changing diapers. It’s my job since I stay home and therefore if I want to use these then I should be able to. I didn’t use cloth diapers as soon as Hannah was born. For the first 7 weeks Hannah was in disposables. I do not regret this decision. It was hard to adjust as a first time mom and it just made it easier. But boy they were expensive! We had to buy a lot of newborn diapers! I had some amazon money from baby showers and used that to buy 2 wet bags, 3 more diapers and some toys and books. It was not bad! She was small enough that I could use just the small newborn insert. She didn’t have many rashes but I had some CJs butter as well to use and it is great! I was quite nervous at first to use diapers when I went out so for the first couple weeks I just used disposables. We had some still from baby showers. Eventually I got my nerve up and used them for outings. It was not as hard as I expected. I did end up buying 5 more diapers when they discontinued some of the colors and put them on sale. 16 is fine but I was having to religiously wash every other day and it was cutting it close. With the second order I also got a couple Thirsties hemp inserts and a prefold! That put me at 21 diapers total and I would typically wash every other day still but can go for 2 days if things were busy. I also got a couple GroVia covers and some snap in inserts to use as a back up when things get dicey for washing. I love the covers and eventually switched to using the covers and the GroVia prefolds for night. That is what I used to diaper Hannah from that 7 weeks until about 21 months. At that point I had to purchase some more dipaers since Teddy joined our family and I’ll have more about that in another post! All in all we are very pleased with our decision to cloth diaper. Even hubby makes comments about liking the ‘reusable’ diapers! He has also heard from coworkers about the cost of diapers and come home saying how glad he is we don’t have to buy them! Do you cloth diaper? If not what is holding you back? *Affiliate links are used in this post. I will receive a small amount back if you purchase through these links. Do you watch Shark Tank? We LOVE shark tank. We have actually found some amazing products from watching Shark Tank. 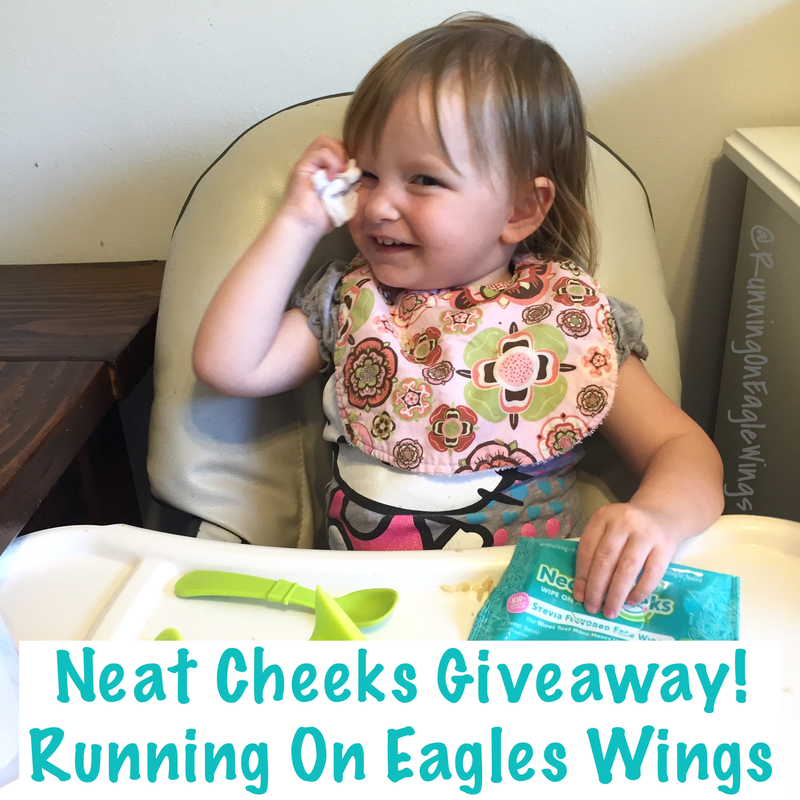 One of my favorite products so far is NeatCheeks! -The taste. They are not soapy like a baby wipe, nor are they bland. The sweetness does actually come through! Hannah enjoys getting them out *just* to lick them. -The size. They are smaller than the wipes we typically use (Huggies), but still plenty large enough to actually wipe both kids up after a meal. Today NeatCheeks is releasing their first Flavored wipe! Currently they are just sweet but now they are going to be flavored! In honor of this new flavor and they will be re-aired on Shark Tank tonight (so watch it!!) 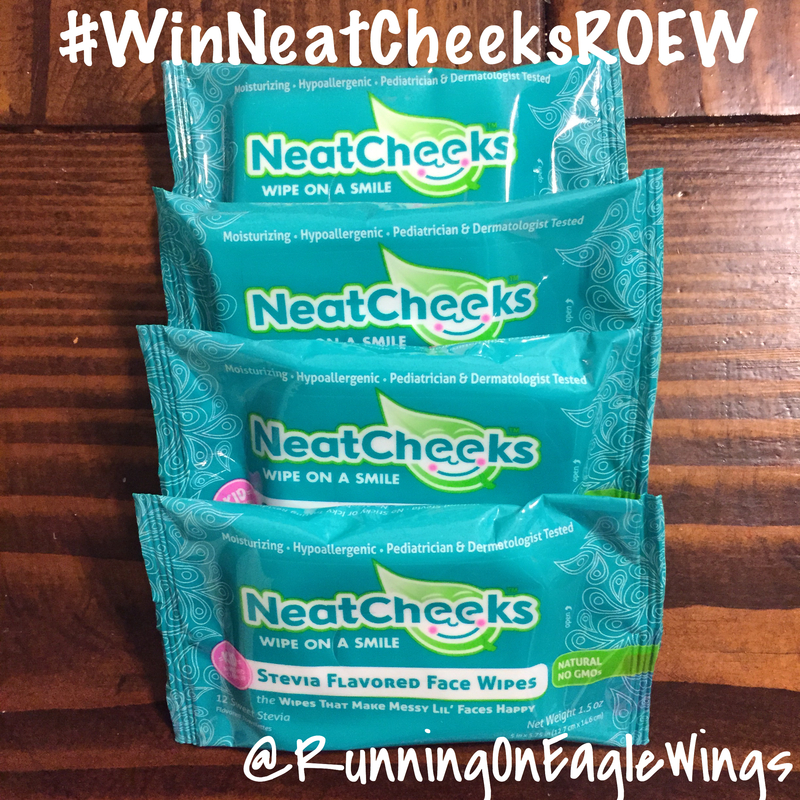 I am giving away 4 travel packs of the original NeatCheeks! Contest will be open through Sunday 8/16 at 6pm PT. Here is the basics of my labor story.. I’m not a gross details person so you can keep reading if your stomach is weak! The few weeks prior to having Hannah, I had been feeling pretty worn out. I wasn’t even going to the gym or walking even really. It was just too painful with how the baby was sitting on my hip. I went to the doc for my 37 week checkup and he decided to check me. At the check I was 1.5 cm dilated and 90% effaced. The 90% was a big surprise and he basically said that this was good – reduces the time I would be in labor and he also figured she would be more ‘on time’ than late. This is always good! Fast forward to the following Tuesday, June 18. I really don’t know what I did all day- worked around the house chilled. Hubby came home and we had dinner and then upon a trip to the bathroom it felt like my water broke! I had no idea what this was supposed to be so I texted a friend and did some internet research. I did a 15 min ‘test’ where you lay down and get back up and see. sure enough.. So told the hubs who was pretty excited! Called the Hosp and they said to Eat then come in! Hilarious. So I ate a banana. yep. was not really hungry but ate anyways. In the ‘trama’ of the birth center they hooked me up and verified my water HAD broken. Turns out out I was also having regular contractions but wasn’t feeling a thing! Doc came in and they checked me at a 2. I was admitted and got my own room! I got started out getting an IV dose of penicillin because I tested positive for Group B Strep. This means that the entire time I was in labor I had to have penicillin every 4 hours. Let me just say this part was not fun. It BURNED going in. After this I had to wait a few hours before anything else could be done. During this time hubs headed out to Jimmy Johns to get food for him and C – My friend who was so kind to hang out the whole time and be my coach! The nurse also let me get a sandwich -I just got a cheese sandwich. Nothing crazy but a bit of food. I ate about half the sandwich. We also watched the latest Mission Impossible movie. It passed the time. I walked around some as well. At 11:30 I was able to elect to get Pitocin. Since at this point I wasn’t even feeling the contractions, yet I was still having them, I opted to get it. I didn’t know how long it would take otherwise! The only stinky part is that you can’t walk around as easily. But at this point in the evening, I was pretty tired. I don’t think I slept but just rested. Slowly as time went by and the pitocin was increased I started feeling the contractions. It was getting semi painful and my back was hurting with the contractions. About 4 am the nurse hooked me up to the portable monitor and had me walk around hoping to get the baby to shift position. Walking was nice, but it was not cool. I was that girl having to stop and hold on the rail for the contractions because walking during them was not really an option.. I maybe walked for 20 mins and then gave up. At this point I don’t remember much. We had the room dark and hubs and C were off and on sleeping and I was just chillin. Actually I was trying to get through the contractions. After awhile C moved over to sit with me and was helping me get through them. They were pretty consistent with little to no break. It was still really hurting my back and in my legs and everywhere. I think around 6/6:30 they came in to check me. I was only at 3cm and still 90%. UGG I was not happy. All that and I’d gotten nowhere. So the doctor from my practice came in to check and tell me who was coming on call for the day. She said at this point if I wanted the epidural to just get it now. No need to wait. She is one of my fav people ever! Unfortunately the nurse was pretty wishy-washy and tried to tell me to wait until I was a 4. Ummm the doc didn’t agree. Get me the meds!! So we decided since shift change was at 7 we would get me on the list as one of the first for the new anesthesiologist. I had to wait about 30 mins but the guy was super nice and very efficient. I didn’t feel like it really hurt at all. The IV going in hurt WAY more!! It didn’t take too long before it really went into effect. At this point we just hung out and I was able to play on my phone and text updates to people. We might have watched TV but I am not a huge TV person so the morning tv bored me and we didn’t keep it on. At 10:30 or so they came in to check me. Good news! Fully a 10, 100% and already down some so ready to go! They then went into speed mode to transform the room and get all the delivery supplies. Best thing about this hospital is you and the baby never leave the room! So they got everything ready and the nurse showed C and hubs how to hold my legs and pushing began! It was not too crazy at first- and we had some good breaks. The nurse was very helpful giving tips for breathing and pushing. I wasn’t really paying attention. Things were progressing and C was so excited and giving me updates! They were counting for me and my breathing. Every so often the doc would show up and check on things. Before I knew it 2 hours had gone by. Say WHAT?! like yeah… Somewhere in here C’s mom showed up and took over the one leg and hubs sat down by my head to support and comfort. It was awesome to have his hands on my shoulder and rubbing my head to help me relax. At some point in here it was evident that she was coming out sunny side up – Face Up. This is not the norm. So the last hour of pushing was a blur. Things were moving along at a good pace but no one really told me how close/far we were! About 2.5 hours in, I started getting hungry. Like starving. Thankfully at this point they let me take sips of water and I had hubs doing some cold cloths on my face to keep me awake. At some point more people showed up in the room and the doc started dressing up. She looked and me and said something like “you are getting close when I start putting the clothes on!” I was pretty excited and we made team work of the last few pushes! Finally we made it and she got all the way out!! It was 1:50 pm – I could see the clock the entire time! C cut the cord and had a blast! Hubs was breathing sighs of relief. Unfortunately I didn’t get her right away. When my water broke, they detected the possibility of meconimum in the fluid so this meant the NICU nurses were in the room and took her immediately to check her out. I remember hearing her first cry and the doc looking at me and smiling. It didn’t take long for the NICU nurses to check her out and bring her over. They gave her to me and I pretty much cried! So surreal and so precious! hubs was with me and we were so in shock! The phones came out to start taking pictures! I got to hold her and hubs held her and then we immediately went into the nursing! She got it to work pretty quick! I was so in shock! While all the photos were going on the doc finished up and stitched me up. Thankfully they wait awhile to remove the epidural. We were enjoying our little one and they clean everything up. Then they take her and weigh her and measure etc. Here is our precious daughter! The rest of our hospital time went pretty well. We settled in with our little one and thankfully we had the nurses to help! Here they send you home after 24 hours and our day nurses on Thursday were not the best so we were more than ready to go home! However I have to say that this was overall a very good experience and we are so blessed to have a healthy baby girl! The birth of Hannah Jubilee!! She joined us 11 days early! Born June 19 at 1:50 pm. Pretty tiny but completely healthy and doing well!